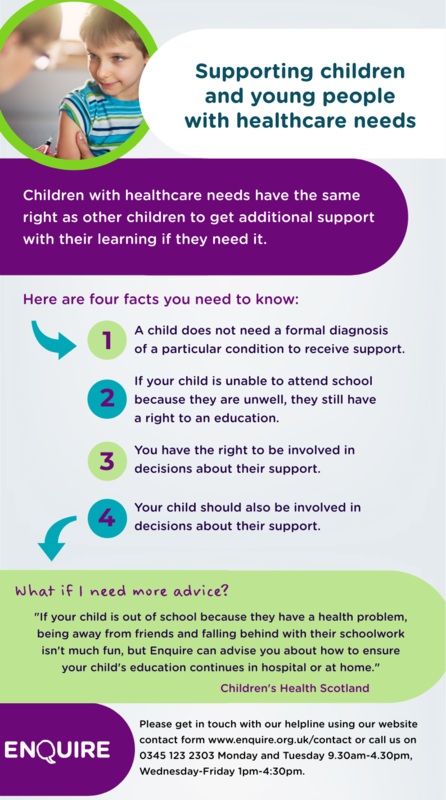 This factsheets explains children’s rights to education and support, what happens if your child wants to use them and the support available to help them. Our easy to read guide to additional support for learning in Scotland explains your and your child’s rights, local authorities’ duties, what to expect at meetings and much more. This factsheet describes the laws affecting children with additional support needs and those with disabilities and what these laws mean for the support your child should receive. 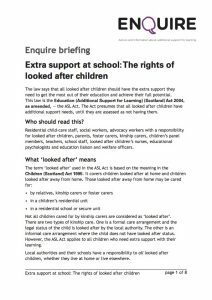 This factsheet explains a looked after child’s right to additional support for learning. This factsheet provides information about the services, help and support you can expect if your child has additional support needs and is under 3 and explains their rights to support at pre-school. This factsheet provides practical information to help you choose the right school for your child. This factsheet explains your right to make a placing request and how you can appeal your local authority’s decision if it is turned down. A handy factsheet summarising all you need to know about assessment. Advice for parents and cares about how schools, local authorities and NHS boards should meet children’s healthcare needs. This factsheet explains the different roles and responsibilities of the professionals who may be supporting your child’s learning. 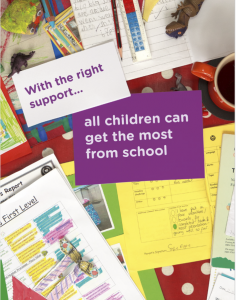 This factsheet explains what local authorities and schools should do to help parents of children with additional support needs take part in their education. This factsheet explains the ways schools can plan your child’s learning, and how you and your child can be involved in this planning. This factsheet explains the criteria a child must meet before they will be considered for a CSP, how to request a CSP and how to appeal if your request is denied. There are lots of reasons why a child can’t attend school. This factsheet sets out the law on school attendance, and what happens if your child cannot attend school regularly. This factsheet explains when a school can exclude a pupil, the procedures the school should follow and how to appeal an exclusion. 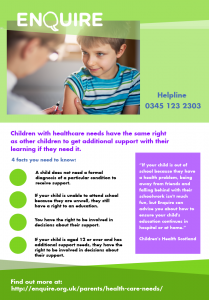 This factsheet explains children and young people’s rights to education and support while they are absent from school because of ill health or unable to attend school for other reasons. This factsheet explains who is entitled to transport to school and outlines the duties and powers local authorities have for providing school transport. This factsheet explains how parents and carers can use dispute resolution processes to resolve disagreements with schools and local authorities. This factsheet explains how independent mediation can be used to resolve additional support for learning disagreements. This factsheet explains what a section 70 complaint is and when and how a parent can make one. This factsheet explains independent adjudication including when and how it should be used. A one-page summary of the steps parents and schools or local authorities can take to avoid and resolve disagreements. This factsheet explains young people’s right to stay on a school and local authorities’ duties to pupils with support needs who are leaving school. A handy one-page summary of transition timescales and local authority duties for pupils with additional support needs moving or leaving school. A handy guide about additional support for learning for healthcare practitioners. 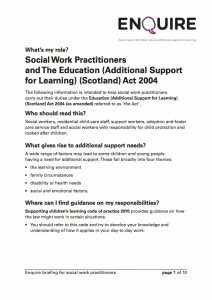 A handy guide about additional support for learning for social work practitioners. 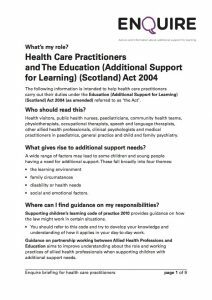 A handy guide about additional support for learning for practioners working with looked after children. Four things you can do if you’re worried your child’s healthcare needs are not being met in school. Four facts you need to know if your child has healthcare needs. Four things a school must do if they formally excluded your child. Five steps you can take if your child is being unlawfully excluded. A useful reminder of the advice and information Enquire can provide about childrens’ rights to additional support with their learning.